Illogiblog - The Illogicopedia weblog: Pickle and win £££! 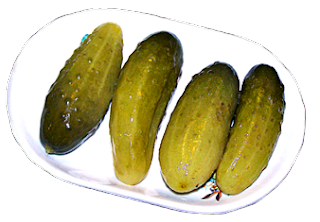 The new pickle writing competition is upon us! That is to say, you don't need to use a pickle as a writing implement to enter. But this ain't just a regular pickle - oh no. This time round there is a possibility that real prizes could be on offer for the winners. The organisers are currently in talks with bigwigs (we're trying to get Nationwide to loan us £24.50) with a view to offering you, the entrants, the chance to win a prize. Stay tuned to the Illogiblog and the official Pickle page for big prize developments.